Many aerospace-related applications exist that require surfaces to move within a given region. This can include bodies moving relative to each other, as happens during a store separation, or surfaces actually changing shape, which is what happens with ablation and aeroelasticity. Design optimization in which many small perturbations are required is another area where mesh manipulation can be a powerful tool. Whenever a surface moves or changes shape, a new volume mesh with the surface in its new configuration must be generated if a computational fluid dynamics (CFD) analysis of the new configuration is required. If the surface movement can be easily decoupled from the CFD simulation, each new mesh can be generated with a capable mesh generation tool such as Pointwise. However, it may also be advantageous to employ techniques such as elliptic smoothing to manipulate the existing mesh within an overarching framework to make the mesh appropriate for the surfaces in their new configuration throughout a CFD simulation. A tool called MeshGrind, in development at the Arnold Engineering Development Complex (AEDC), employs the Winslow elliptic smoothing equations to perform mesh smoothing. The Winslow elliptic smoothing equations, first proposed by Alan Winslow in 1967, are derived from Poisson's Equation (or Laplace's Equation for the homogeneous case) for a parameter distribution over a region. In structured meshing, there is an implicit computational space that is ideal for implementing the Winslow equations. However, no theory currently exists to generate a global computational space for an unstructured mesh that reflects a consistent geometric regularity as is done with structured meshes. Fortunately, it is not necessary for the entire computational mesh to be constructed as an overarching system; each node in computational space can be isolated from the overall system as a virtual control volume (VCV) and coupled though the coordinates in physical space. VCVs are utilized in MeshGrind to provide the computational space necessary to accommodate unstructured mesh smoothing. MeshGrind is an unstructured grid tool that can operate on both 2D and 3D meshes and has been shown to be effective for smoothing unstructured meshes originally generated in Pointwise. Using conventional virtual control volumes, the Winslow equations have been shown to be ideal for smoothing non-surface nodes in inviscid regions. By introducing ghost points to complete the computational space stencil for surface points, the Winslow equations can also be applied to nodes on a boundary surface. Furthermore, the Winslow equations can be used in boundary layers by using iteratively adapted computational spaces that take into account the high aspect ratio of cells in a boundary layer and the general benefit of having near-surface nodes advance away from a surface in an orthogonal fashion. One of the areas in which surface movement is of paramount importance is in bio-inspired flight where the flapping wing motion must be accounted for. To explore this area, a solid model of a dragonfly was constructed from dragonflies caught in the Arnold wildlife area. A surface mesh (shown on Figure 1) and initial volume mesh were generated in Pointwise and exported in Vgrid format, which is the 3D format currently used by MeshGrind. 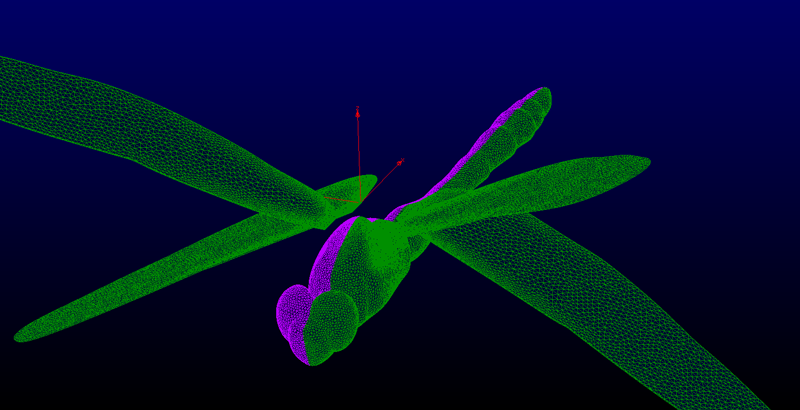 After the volume mesh was generated with the wings in their initial position, the wings were driven to new positions using a prescribed motion based on the flapping patterns found in literature. As the surface mesh moved, the elliptic smoothing algorithms in MeshGrind continually drove the volume mesh to new configurations in order to conform to the surface mesh. Examples of the mesh movement are shown in Figures 2 and 3. A new mesh was generated for each one degree of wing oscillation and the mesh movement was automated so a human would not have to be in the loop when looking at a cycle of flapping motion. Although elliptic smoothing can be extremely valuable for manipulating a mesh with moving boundaries, it is not a tool that can be utilized to generate the initial mesh. For that, a grid generation package must be used. Pointwise proved to be an ideal tool for this task because it generates high quality meshes and gives the user great flexibility in choosing a suitable output format. The large selection of output formats allowed a format to be chosen that was easy to interrogate to glean the mesh connectivity information needed to apply smoothing to a mesh. In addition to ease of output, Pointwise also provides useful metadata such as the number of nodes and cells in a viscous region generated by anisotropic tetrahedral extrusion (T-Rex), Pointwise's viscous unstructured meshing technique. This allowed the smoothing to be tailored to more efficiently smooth given regions of the mesh using the most appropriate techniques. 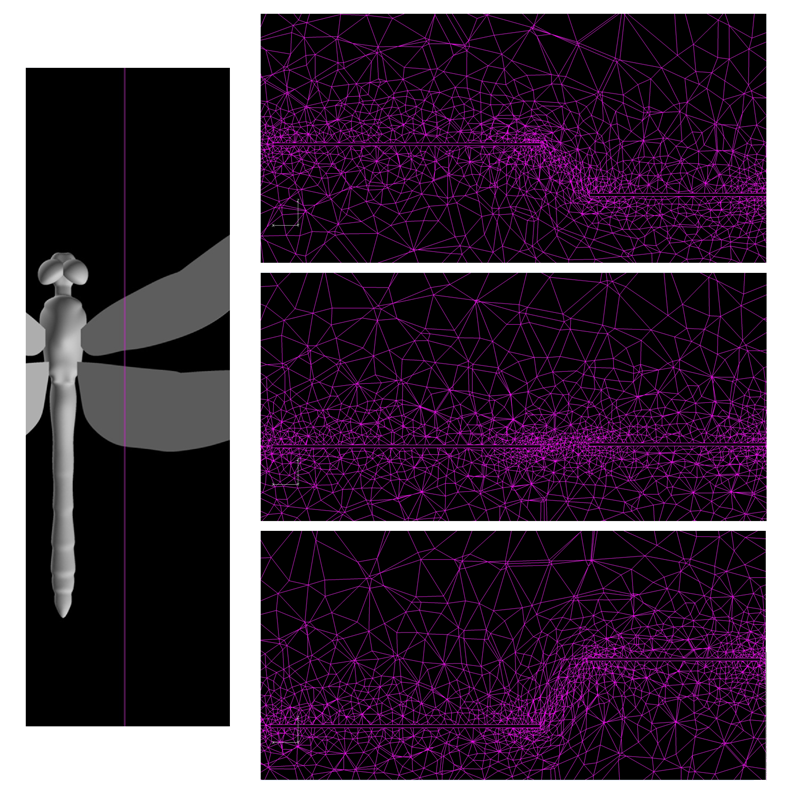 Figure 1: Dragonfly surface mesh. Figure 2: Mesh movement during flapping movement as seen from the front. Figure 3: Mesh movement during flapping movement as seen from the side. 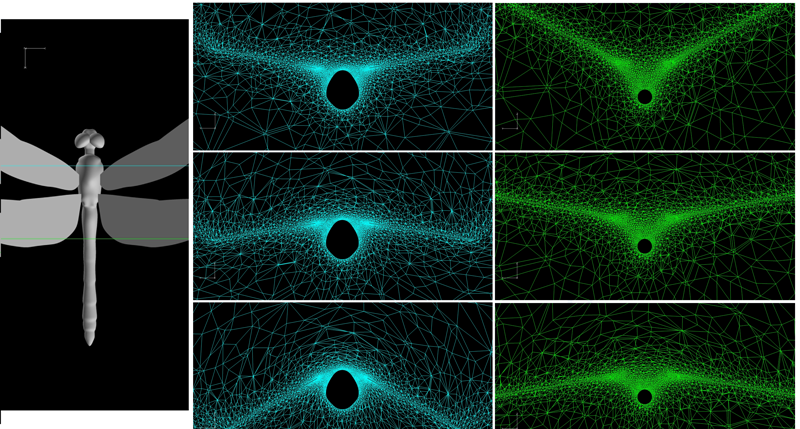 For certain aspects of relative body motion, such as store separation, elliptic smoothing is not a practical tool because no points are added to the initial mesh. Therefore, if the distance between two bodies varies greatly, the resulting mesh would be of low quality. However, for many cases in which the mesh density in a given area of interest remains relatively stable, elliptic smoothing can be extremely useful. Flapping motion is actually much more extreme than many cases in which surface movement is required, such as aeroelasticity and ablation or conventional control surface movement such as the movement of a flap or aileron.